Action returns to the Korakuen this coming Thursday with a show from Kyoei. In the main event fans will see former world title challenger Hisashi Amagasa (30-6-2, 20) take on Filipino visitor Carlo Demecillo (6-2, 1) in a 10 rounder. Amagasa, best known for his 2014 bout with Guillermo Rigondeaux, will be returning to the ring for the first time since he lost a decision in England to Josh Warrington, in a bout that was much more competitive than the score-cards suggested. Although coming in on a loss Amagasa will be strongly favoured as he faces the PBF Bantamweight champion, who should look dwarfed by the freakishly big Amagasa. In a notable under-card bout former world title challenger Tomomi Takano (8-2, 5) will face off against Wondergirl Sithsaithong (0-2). This will be Takano's first “bout” since her loss to Daniela Romina Bermudez in a WBO female Super Flyweight title bout. This should be a straight forward win for Takano but she'll need to do more than just win here if she's to get her career back in track, especially given her public fall out with her promoter earlier this year. Although the rest of the card isn't particularly strong there are two interesting domestic clashes on the card. 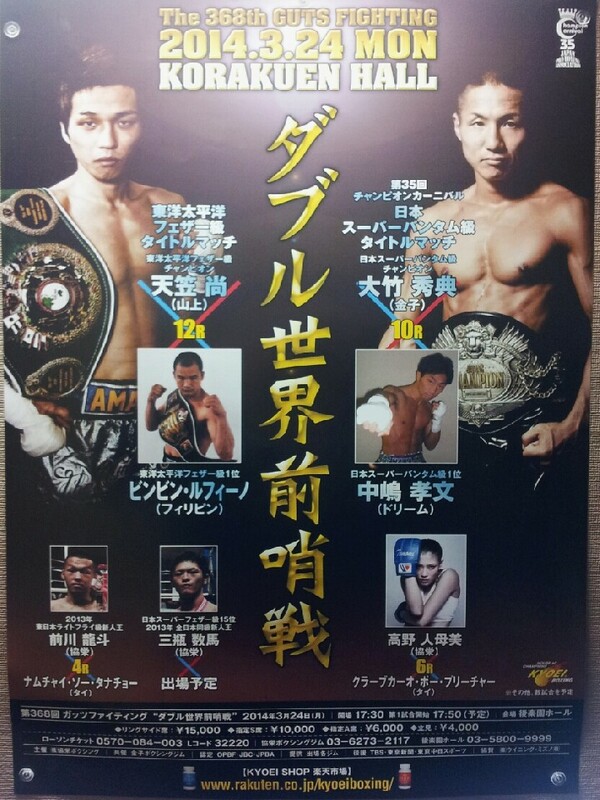 One of those will see Tomoya Yamada (13-7-1, 4) take on Takaki Sakurai (7-6-1, 3) in a Lightweight bout. Coming in to this Yamada is top 10 ranked by the JBC and will be risking his ranking. The other will see JBC ranked Light Welterweight Kazuki Matsuyama (13-7, 7) take on the heavy handed Kentaro Endo (6-7, 5). On paper this looks like a mismatch but Matsuyama has been stopped in 2 of his last 3 and Endo is better than his record suggests. November 11th-Tomomi features in Title action! Japanese fans get more title action on November 11th as they get a double female world title show. The most notable of those titles fights comes at 115lbs where model-boxer Tomomi Takano (8-1, 5) goes up against Argentina's Daniela Romina Bermudez (17-3-2, 5). The bout sees Takano stepping up massively against the WBO female Super Flyweight champion who has proven her ability on the tough South American scene, where she has faced the likes of Yesica Yolanda Bopp and Mayerlin Rivas. Although it's a step up for the challenger she has been preparing with the best and has been sparring with Naoko Fujioka who she will hope to replicate in becoming a world champion. The other title bout is an all Japanese affair as Kumiko Seeser Ikehara (7-1-2, 3) defends her WBO female Minimumweight title against Momoko Kanda (9-7-2, 3). On paper this looks like a massive mismatch with Kanda going in as the major under-dog however she is better than her record suggests and has rebuilt well after a 1-6-1 run in the middle of her career. For Ikehara this will be the third defence of the title she won in September 2014 and whilst she will be hoping to retain her title she will also be hoping to avoid headclashes, which have plagued her last two bouts. As well as the two world title bouts there is another notable name on the card with former world title challenger Hisashi Amagasa (29-5-2, 19) battling against Filipino fighter Nathan Bolcio (12-9-2, 5). Amagasa is expected to win here and will then continue his chase towards another world title fight, with the fighter himself said to be eyeing up a shot at Lee Selby. Whilst there will be two men in the ring, Bolcio has lost 5 of his last 6 and has only scored 2 wins in his last 10 bouts. ​Also on this card will be the promising Kenta Onjo (5-1, 3), who will be facing Tomoya Yamada (12-6, 3) whilst seeking his second win since being shocked by Jonathan Baat earlier this year, and Ryoichi Tamura (4-2-1, 1) who takes on Yuki Matsudo (10-2, 6) in a very good looking Super Bantamweight clash. June 10th-Shingo Wake and Hisashi Amagasa are...double impact! Action returns to the Korakuen Hall for the second time in the space of just 3 days for what is set to be another very interesting card. This one doesn't have as many good match ups as the June 8th show but it does have 3 bouts that are worthy of some real attention. The most significant of those bouts is an IBF Super Bantamweight world title eliminator between Japanese slickster Shingo Wake (18-4-2, 11) and experienced Thai visitor Mike Tawatchai (35-7-1, 21). Wake comes into this bout on an impressive run of 8 straight wins, with 6 by way of T/KO, and should rightfully be favoured however the Thai is himself unbeaten in 9 and is very highly ranked by the IBF following a reign as the IBF Asia champion. Notably Tawatchai is 1-7 in Japan and will be hoping to score his first win in the country in more than 5 years, a tough ask against someone as good as Wake. In the chief support bout we'll see the return to the ring of former world title challenger Hisashi Amagasa (28-5-2, 19), who fought Guillermo Rigondeaux at the end of 2014. Amagasa has been matched with visiting Thai Patomsith Pathompothong (12-3, 5). Patomsith is facing his most notable foe to date though it is possible that Amagasa will still be suffering the effects of his loss to Rigondeaux, which finished with the Japanese fighter looking like a swollen mess. The only title fight on this show is a bout for the OPBF female Super Bantamweight title and will see the once beaten Tomomi Takano (7-1, 5) take on Thailand's Nongbua Lookpraiaree (9-12-1, 1), who is a replacement for Filipino Carleans Rivas. We suspect that Takano will be the more skilled of the fighters in the ring here but she has shown questionable stamina and Nonbua has only been stopped once in her 12 losses. Interestingly we did manage to find footage of Nongbua fighting South Korea against Hee Jung Yuh and from the footage it does seem like she could test Takano. It's not just Japanese fans getting action but also Thai fans who will be getting a show from Khon Kaen which will be televised on Channel 7. The main event here will see the very good Suriyan Sor Rungvisai (40-6-1, 20) battle against the upset minded Filipino slugger Jomar Fajardo (14-7-2, 7). Whilst Fajardo did impress us in both of his fights against Francisco Rodriguez Jr this does seem much too much for the “Wallopman” who has no right fighting at Bantamweight. In a supporting bout the unbeaten Kongfah Nakornluang (21-0, 13) will take on Filipino visitor Wilber Andogan (10-19-4, 4). The weight difference between the two men here should again take any real drama from the bout and Andogan's key aim will be to make things fun to watch rather than try to win. Whilst Kongfah is flawed he should be far too good for the Filipino journeyman. For a second successive day Japanese fans at the Korakuen Hall get a great domestic card. On Monday it was Ohashi Gym's "49th Phoenix Battle" a day later the action is courtesy of Kyoei Promotions who put on a very solid 7 fight show. The show, the "369th Guts Fighting" card, is headlined by an OPBF Featherweight title fight between the very talented Hisashi Amagasa (26-4-2, 17), defending his belt for the second time, and the little known Thai Maxsaisai Sithsaithong (14-4, 3). For us this is a mismatch and Amagasa, who has world rankings with all 4 major organisations, should easily come out on top against a very limited Thai opponent, though of course upsets happen and Maxsaisai could surprise us all, though that would go down as one of the biggest upsets of the year so far. Although the main event is the only title fight on the show the card does have a strong supporting cast with the chief support bout being a contest between the Japanese ranked Super Bantamweight Mikihito Seto (24-11-2, 18) and unranked domestic rival Takenori Ohashi (11-3, 7). Seto is a former interim Japanese Super Bantamweight champion but has lost 3 of his last 6 bouts. Another support bout sees Japanese ranked Super Flyweight Toyoto Shiraishi (24-8-1, 11) battle against the limited but extremely hard working and brave Mako Matsuyama (7-8-1, 3). Matsuyama, who was last seen in the ring being stopped in an all-action fight with Rex Tso, is up against it again here but will put it all on the line in an attempt to to upset his more established and more experienced foe. Shiraishi has lost 3 of his last 6 but they have been at a very highly level and shouldn't be held against him too much. Another Japanese ranked fighter in action on this show is Kazuma Sanpei (10-0, 4) who puts his Japanese Super Featherweight ranking on the line against Jun Hamana (9-1, 3) in a genuinely compelling contest. Hamana is unranked and has got a solitary loss but is a very good promising 23 year old prospect whilst Sanpei is a very highly touted 19 year old prospect that some are describing as a future world champion at Super Featherweight. The winner of this will still be quite a distance from being competitive with Rikki Naito but the winner will be expected to become a domestic contender in the next year or two. One more ranked fighter on this show is Kai Johnson (4-5-3, 1) who will be hoping to end the unbeaten run of the much talked about Tomomi Takano (5-0, 4). Johnson will be risking her OPBF female ranking against Takano who will be hoping that a win helps move her into a title fight. Although the records of the two fighters are very different and Takano is the favourite this is a clear step up in class for the unbeaten fighter who will be expecting a stiffer test here than she has so far in her career. The shows second bout, will see yet another unbeaten fighter in action as the touted Ryuto Maekawa (8-0, 5) battles against Takushige Sato (5-4-1, 2) in a 6 rounder. Maekawa is just 18 and yet very highly touted with international experience, courtesy of fights in Thailand and the Philippines, and a fun to watch style. Sato will be expected to test the teenager but we don't think he'll be able to match him. One of the best things about the second tier Asian shows, especially Japanese ones, are that they tend to be stacked with a number of interesting bouts, often 2 title bouts and one or two notable prospects or ranked challengers. That type of show is what we have several times this coming week in what is one Asian's boxing's best weeks so far. On Monday we kick off the week with 2 title fights in the Korakuen Hall, as well as bouts involving one of the most famous female fighters in the east and several very promising prospects. The card will kick off with the promising Ryuto Maekawa (7-0, 4) fighting against a Thai opponent, whose name currently eludes us. Aged just 18 Maekawa is already a well travelled fighter having fought in both Thailand and Japan before finally returning to Japan where he looks likely to make his name. Although Maekawa made a controversial decision last year to drop out of the Rookie of the Year tournament many are eyeing him as a potential champion and we'd be shocked if he faced a really tough Thai here. The second bout on the show will feature another unbeaten man in the form of Kazuma Sanpei (9-0, 3) who we believe won the All Japan Rookie of the Year tournament at Super Featherweight last year. The 19 year old Sanpei will be hoping to extend his winning record to double figures as he takes on Thailand's limited Anuntachai Sor Por Lor Krungthep (6-6, 4) in what should be a show case bout. A third unbeaten fighter will be on show in the card's third bout, this time the hugely popular Tomomi Takano (4-0, 3) who will be facing a Thai opponent in a 6 round bout. Whilst we don't know the name of the Thai we do view this as being a step up for Tomomi who has never been in a bout scheduled for more than 4 rounds. We're lead to believe that her training has been going very well and that we'll seen an improved Tomomi this time out. The first of the two title fights on the show will see the world ranked Hidenori Otake (21-1-3, 9) in action as he defends his Japanese Super Bantamweight title. Otake has already already notched up 3 defences though will be facing the man he beat to win the title, Takafumi Nakajima (22-6-1, 9) in what looks likely to be a very competitive contest. When the men first met Otake took a split decision and we'd not be shocked to see this being equally as hard fought and competitive. Following the first title fight we then get a second as OPBF Featherweight champion Hisashi Amagasa (25-4-2, 16) takes on experienced Filipino Vinvin Rufino (34-15-3, 16). On paper this looks like a complete mismatch though in reality Rufino is much better than his record indicates and is the #1 ranked contender for the OPBF title. We do expect the champion to retain though we do know that Rufino is tough and although his record doesn't show it he is heavy handed. This could be a difficult assignment for Amagasa who will likely feel that he should be ready to move into world title fights by the end of this year.